If you were injured by equipment or machinery at work you only have a limited amount of time to file a workers’ compensation claim. It does not matter if the injury was your fault or not. Even if your injury did not cause you to miss much time at work, you could recover money. This is especially true if you had any permanent damage from the injury such as scarring, disfigurement, loss of limb, or inability to use a part of your body. 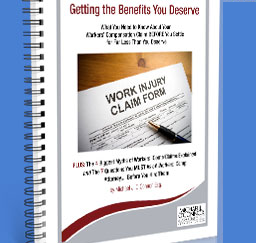 You should speak with an experienced workers’ compensation attorney. We offer a free case review and consultation to let you know what your rights are. The insurance company is not your friend. They will try to resolve your case as cheaply as possible, which could leave you struggling to pay your bills and maintain your lifestyle. Call us today at 1-800-518-4529 or fill out our contact form to see how we can help you. For many working Pennsylvania residents, heavy equipment and machinery are an everyday part of life. Construction workers, factory workers, warehouse workers and many other occupations involve using equipment and heavy machinery that can be very dangerous. Even lighter equipment that does not seem very threatening can cause serious injuries if something goes wrong. When equipment malfunctions, is not used properly, or does not have the correct safety precautions, people can get seriously hurt or even killed. It is not uncommon for a worker to get a body part crushed or amputated by equipment. Small, lighter equipment can also have a devastating effect if it malfunctions. Electrocution from even the smallest tools and equipment can cause serious injuries. 1 in 10 accidents on the job are equipment related accidents, according to the Occupational Safety and Health Administration (OSHA). Across the US there are about 150,000 injuries on construction sites each year, according to the Bureau of Labor Statistics, and injuries from equipment are the second most common cause of these accidents. Any equipment or machines with moving parts however can cause injury. According to Pennsylvania workers’ compensation laws, a worker can file a workers’ compensation claim if they are injured at work or in the course of their work duties. Because Pennsylvania is a no-fault state, it does not matter if the injury was the fault of the worker or the fault of the employer. If the injury was caused by equipment that failed or did not have the proper safety precautions, a third party suit may be brought against the manufacturer of the equipment. An experienced workers’ compensation lawyer can tell you if it is a good idea or not to file a third party suit. Equipment injuries can become complicated cases pretty quickly. Depending on the circumstances of the injury different actions may need to be taken. A case in which the injury occurred while repairing the equipment may be different from a case in which the injury occurred during normal use of the equipment. The case could also become more complicated if the worker was not properly trained or if conditions that day were a factor.